The renovation of this national monument building includes a butcher shop on ground floor and cellar and the apartment on the two upper floors in the historical part of Amsterdam. Being built in phases since 1600, this building is actually three attached buildings that became one labyrinth of small rooms with different heights and levels. To a certain extent, this variety is also the spatial quality of the building and the charm of his past. The design is based on taking all the inner walls away and letting the vertical diversity show which gives the feeling as if one is walking in the inner space of three different buildings. All necessary functional changes (a bigger room in the rear, a balcony entrance hall, etc) had been combined into one architectural tool: one wall which crosses diagonally the three buildings. The spatial quality here creates a 'conversation' between the vertical variety of the historical building and the diagonal line of contemporary needs. 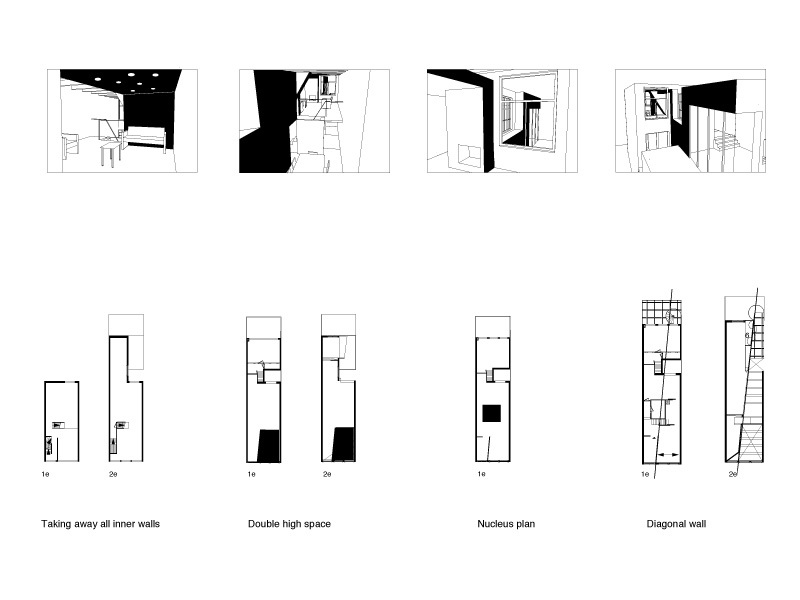 By taking away all walls, each of the two levels of the apartment becomes open space, divided only by a floor. Between the two stories of the apartments there is a double high open space which is oriented to the west thus letting sunlight enter the whole apartment. Taking away all dividing walls in the shop gives one a long perspective view crossing the whole shop. In this continuing one space there is a diversity of small places for diverse activities such as a butcher shop, working place, and a buffet with corner products. From the shop one can walk up the stairs along an inner patio (which is a reminder of the historic open patio that used to be there) up to a dining area and open balcony to the garden behind. Also, the space under the ground has been dug away one full story height. All heavy production machines and cooling rooms are situated on that floor.